Boeing has said that it will investigate the wiring defect that was found in a fire extinguisher system on three of its 787 Dreamliner jets. The fault was found on jets operated by Japan's All Nippon Airways (ANA). After ANA reported the fault on Wednesday, rival Japan Airlines turned back a 787 plane travelling to Helsinki from Tokyo to check the wiring. It is the latest issue to hit the 787 jet after battery problems grounded the entire fleet earlier this year. Boeing said it was aware of the latest issue and was looking into the matter. "The safety of those flying on Boeing aeroplanes is our top priority. We will thoroughly examine this issue and take the appropriate steps," the firm said in a statement. The 787 Dreamliner is considered to be one of the most advanced planes in the industry. However, the jet has been hit by a series of issues in recent months. In January, the entire 787 fleet was temporarily taken out of service amid safety concerns. This was after fire broke out in one of Japan Airlines' 787 Dreamliners, and a ANA flight was forced to make an emergency landing because of a battery fault and a fire in one of the electrical compartments. In July, a fire broke out on a 787 Dreamliner jet operated by Ethiopian Airlines while it was parked at Heathrow airport. The fire was traced to the upper rear part of the plane where a transmitter used to locate aircraft after a crash is located. 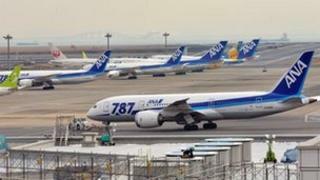 Japan's ANA said it had found damage to the battery wiring on two 787 locator transmitters during checks. US carrier United Airlines also found a pinched wire during an inspection of one of its six 787s. Boeing has since asked airlines to carry out inspections of the transmitters. It has also ask operators of other plane models - the 717, Next-Generation 737, 747-400, 767 and 777 - to inspect aircraft.